The International Society for Technology in Education or ISTE is having a convention in Chicago. Three wonderful educators, Lisa Dabbs, Christine Pinto and Alice Keeler decided to take a road trip across the country to the ISTE convention. Along the way they stopped and talked to different groups of educators (#ISTELadiesRoadTrip). I had the privilege of attending one of their presentations. Each educator presented some great ideas with fantatstic enthusiasm. Alice Keeler had two ideas that really made sense. One idea she presented was about worksheets. She felt that if you take an existing worksheet and simply put it online as a PDF that there is no real benefit to you or the student. Alice suggested to turn the worksheet into a google form. That way you can open one document and examine the answers from an entire class. This would allow you to get a feel for how students are doing and provide immediate feedback. This seems to be much more beneficial for the students and teachers. Alice had another great idea. Many teachers start with "bell ringers" to begin the class. Alice likes to put these in google slides. Here is what she does. She makes up one google slide with the bell ringer. She then names the version history "clean slate". Students come in and find that the slide presentation is shared with them. Each student must add a slide with the answer and then write their name in the notes of the slide. Students must then find another slide someone else did and provide an appropriate critique. The teacher can get a quick glance at all the slides to see who is participating and who is not. At the end of the activity, Alice likes to go back to version history and save this as a new version. She then clicks that button that allows her to revert back to the original version so it is ready for the next class. This procedure makes the bell ringer much more ineteractive and holds students accountable. I also learned another trick from Alice that greatly improves a bell ringer in google slides. The "presentation" button has a "Q and A option". This puts a URL on the presentation that everyone can see. Students can use the URL to ask questions at any time. Only the presenter can see the questions. 1 - International Society for Technology in Education conference logo - Chicago 2018. 2 - The example bell ringer in the preview graphic is from Bell Ringers for Conservation of Mass.Published by Amy Zitzelberger in October 2015. I love these ideas! Thanks for sharing. I have a few technical questions that I hope you can help with. 1) When sharing the slides--is this done by sharing to a students email address? To be clear -- not shared on Google Classroom, but shared to a students google email? Or, can it be done through Google Classroom? When I tested it, I shared it via Google Drive, not classroom. 2) When using the Q and A option, how can students click on the URL to ask the question. When I tested this out myself (with two separate google accounts) I had to type in the URL to ask a question. The presentation version, with the clickable URL, was not shared with me. But I was not doing this through google classroom. I was doing it in Googe Drive with a shared version. 3) Do you know how the author created those pictures in Google. Was it using Google Draw? I have not tried that yet. Thanks for any google help you can give me and thanks for sharing! Suzanne - Here is what I know and how I think I am going to try this..hope this makes sense. 1). I plan on sharing to google classroom. 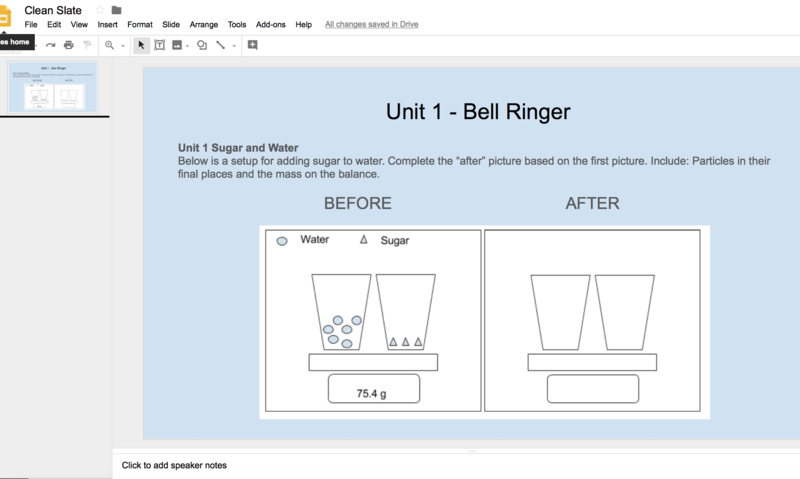 Also, when I share to google classroom, make sure students can "edit" it and call it a specific topic like "bell ringers". This means that at the end of the quarter or semester, they can sort by topic and easily pull up just the bell ringers. 2) Pretty sure the "Q and A" url is one that a student has to type in a browser and not one they click on. It is pretty much controled by the presenter. I was planning on just putting this on the board and telling students to ask a question at any time and do not be anonymous. 3) Not sure about the picture but here is the source. The example bell ringer in the preview graphic is from Bell Ringers for Conservation of Mass.Published by Amy Zitzelberger in October 2015. For what it is worth, I have had experience with google draw. It is not bad. You can also save drawings as a template which is a nice feature. I really hope this helps and I appreciate your thoughts. I plan on starting this on day one. I will certainly be happy to share any good, bad or fair points. Keep in touch and thanks again! That Q & A function is pretty neat...I never knew that was there. thanks for the heads up! Glad I could help. Google is strange in that they tend to make changes to their products and they do not always advertise or tell people. I don't usually find out about stuff like this until I either stumble upon it by accident or here about it from another teacher. If you do the bell ringers, let me know how it goes.